A healthy shower filter for hot and cold water filtered from chlorine and chloramines . 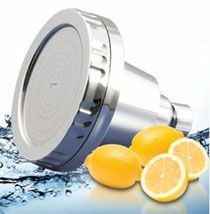 shower filter uses natural vitamin C (equivalent to 3000 + lemon). shower filter is excellent for immunity, skin and hair. Why Use A Shower water Filter? As you may know, chlorine in our shower water damages skin and hair and can pose other serious health risks. The patented technology in AlkaViva Ultra pHresh Ionizing water Shower Head creates a noticeably different shower experience that will leave you feeling refreshed and relaxed. The water ionizing plate contains a unique technology that generates 400,000+ negative ions per cubic centimeter . Inside a natural vitamin C gel water filter (equivalent to 3,000 lemons) removes harmful chlorine in water and adds natural moisturizers that can help relieve skin irritations. It also conditions and softens the water without using any harmful chemicals. You will feel rejuvenated, as if you have been standing under a waterfall full of negative ions. Tested over many months by AlkaViva management, the unaminous conclusion was that the Ultra pHresh shower head produced the best shower experience ever. Just like drinking ionized water, you really have to try it to feel the difference. The Ultra pHresh Ionizing Shower Head will bathe you in a strong, powerful and satisfying stream and is guaranteed to give you the most embracing (gentle yet firm) shower you have ever experienced. Yet at the same time you benefit from using about half as much water and energy as other conventional shower heads. So, not only do you get a truly unique shower experience, it is also a great money-saver. And if you live in a very hard water area and the head clogs from mineral buildup leaving you with an unsatisfying water flow then the patented ionizing plate is removable so you can easily clean it. Enjoy your Ultra pHresh shower for years to come. You will never want to shower under anything else. We are so sure you will love this shower experience that you can return it any time in the first year for a full refund of your purchase price! Get clean water . Get ionized water . Get Ultra pHreshed from a shower with clean , ionized , chlorine free water ! shower /water Filter Capacity: About 5,500 Liters! Health Benefits: Removes chlorine from water . What is Wrong with other Shower Filters? In an activated carbon water filter (AC), chlorine is attracted to and held (absorbed) into the surface of the carbon particles. AC water filters have been shown to be effective in reducing certain organic chemicals and chlorine in cold water. Unfortunately, the efficiency of absorption is quickly nullified when the water becomes warm. (the Ultra pHresh shower filter works as well in hot or cold water). In addition, some activated carbon shower water filters can become clogged very quickly by the dirt it is meant to stop. As soon as this occurs, it immediately starts to supply dirty water. Due to these flaws, the lifetime of an activated carbon shower water filter can be very short. KDF water filter , another widely used de-chlorination water filter, is comprised of copper and zinc. It removes chlorine by reversing the electrochemical process that originally separated the chlorine from sodium. It cannot, however, remove chloramines, another toxic chemical. Unlike the Ultra pHresh shower filter , the efficiency of some KDF water filters depends on the temperature of the water. KDF shower filters can also be affected by water pressure. When the water pressure is low, water simply cannot pass through the filter contents effectively. The major problem of KDF shower filters is that the lifetime of the water filter depends on the quality of the water passing through it. This is truly a catch-22. A water filter is needed most when our water quality is bad. Dirt can quickly covers the surface of the KDF water filter which, in turn, makes the KDF water filter less effective almost immediately. Other shower filter manufacturers use sulfur-based compounds such as calcium sulfite or sodium sulfite (or sulfate) as de-chlorinating agents. The addition of excess sulphite and sulfate chemicals to our water supplies has always been a concern. These sulfur-based compounds can be toxic to humans. Ultra pHresh bath water filters shows exceptional water filtration performance in dirty water; under hot AND cold water temperatures. Ultra pHresh is also more environmentally conscious than traditional activated carbon, KDF or sulfur-based chemicals such as calcium (or sodium) sulfite or sulfate. Vitamin-C is not toxic to humans and is known to boost the immune system and improve skin and hair. Ultra pHresh is a specialty shower water filter that utilizes the power of Vitamin-C to neutralize 100% of the chlorine and chloramines in your bath and shower water (cold & hot water). It is widely known that Vitamin-C is a powerful anti-oxidant inside the human body. What is not well-known is that Vitamin-C also acts as a neutralizing agent when it comes into contact with chlorine and chloramine. The Vitamin-C in the Ultra pHresh filter also provides an additional source of Vitamin-C; an essential nutrient for a healthy body. The Ultra pHresh Shower Filters utilize ascorbic acid chemistry for de-chlorination. Vitamin-C does not hold the chlorine; it neutralizes chlorine from an toxic substance into a harmless compound. In more simple terms, Vitamin-C changes chlorine and chloramine from something that can cause you harm to things that cause NO HARM. 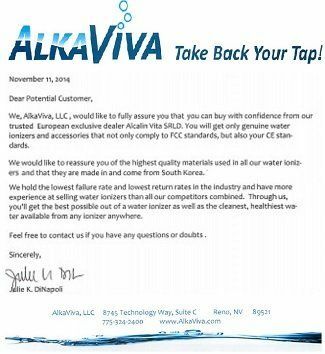 This patented AlkaViva water filter effectively removes the harmful affects of chlorine and chloramine from your water source. Vitamin C is known for building a strong immune system and as a nutrient for skin and hair. The use of Vitamin C is more environmentally conscious than traditional activated carbon, KDF or sulfur-based chemicals such as calcium (or sodium) sulfite or sulfate. Vitamin C is not toxic to humans and is safe for the tenderest skin. The Ultra pHresh vitamin C shower water filter lets you enjoy chlorine-free, odorless, clean and nutrient-rich showers year round. Ultra pHresh uses the newest technology of Vitamin C water filtration to dechlorinate your shower or bath water. What is Ultra pHresh’s filtering material? Each Ultra pHresh shower water filter contains 100% Pharmaceutical Grade Vitamin-C. The Vitamin-C used in a Ultra pHresh water filter for shower is 100% natural and is an excellent source of Vitamin-C for strengthening and improving the condition of your body, skin and hair. How does the Ultra pHresh water filter for shower head remove chlorine and chloramines from water? The Ultra pHresh filter utilizes ascorbic acid chemistry for de-chlorination. Vitamin-C does not hold the chlorine; it neutralizes chlorine from an element into a harmless compound. In more simple terms, Vitamin-C changes chlorine and chloramine from things that can cause harm to your body to things that cause NO HARM to your body. Has Vitamin-C ever been used to de-chlorinate water? Yes. Vitamin-C de-chlorination has a lengthy and proven history. It has been used by the EPA for the de-chlorination of lab samples. In the medical industry, it is the standard for critical applications such as dialysis, where the introduction of chlorinated water would be catastrophic. Is there any scientific evidence that Vitamin-C can be used in water de-chlorination? Yes. The U.S. Environmental Protection Agency (EPA), National Risk Management Research Laboratory demonstrated that Vitamin-C is a safe and fast water de-chlorination agent. Click Research for detailed information. Radiant Wash has also obtained certified EPA laboratory testing to prove that AlkaViva water filters work! Is the Ultra pHresh Shower Head easy to install? Yes. Simply unscrew your existing shower head and screw in your Ultra pHresh shower head. Do Ultra pHresh water filters require maintenance? No. The Ultra pHresh water filters for shower head does not need any maintenance. You simply install it and enjoy chlorine-free water showers. Do I have to back flush the Ultra pHresh water filter? No, back flushing is not required or recommended when using Ultra pHresh bath & shower water filters. How do I know when to change the shower water filter? Ultra pHresh water filters are easily installed inside the shower head. An occasional check will show how much of the water filter has been used up. Or you can wait until you begin to notice chlorine coming back into the shower water. Will the Ultra pHresh shower head reduce the water flow rate of my shower ? Yes. There is a water flow rate reduction of about 10-25% but the patented way the holes are created does not give you any sense that you are using less water – on the contrary we guarantee this will be your most enjoyable showering experience ever! Does the water filtration performance and life of the Ultra pHresh water filter depend on temperature or pressure of water? No. The Radiant Wash filter works for any water temperature (hot or cold), any water pressure (high or low), and any quality of water.